Argentina occupies the centre and east coast of the southern part of South America, the west coast being occupied by Chile. It was discovered in 1519 by the Spaniard Juan de Solis. A permanent Spanish settlement was established at Buenos Aires in 1580. Argentina set up its own government on May 25th 1810 when Napoleon conquered Spain, and declared independence formally on July 9th 1816. Much of the earliest coinage was restricted to a limited national coinage supplemented by provincial issues. 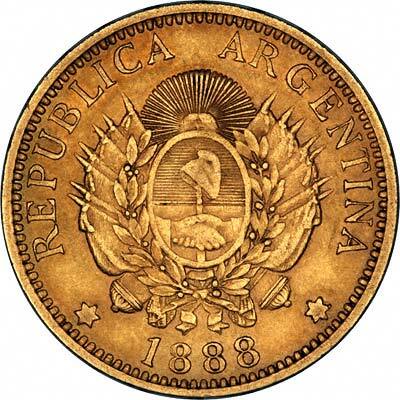 A decimal coinage was introduced from 1881 with 5 pesos to one argentino. 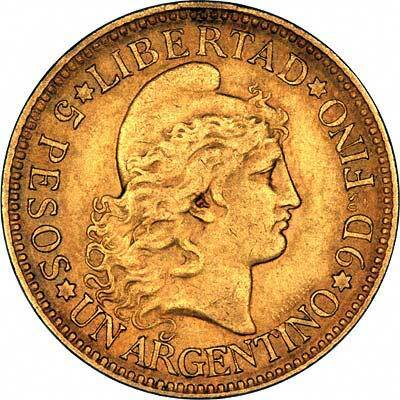 Argentina has only produced a limited number of gold coins, the early coins were denominated in escudos. From 1881 to 1896, argentinos were issued which were equivalent to five pesos, and there was also a half argentino, although these were only issued in two years, and both dates are rare. For silver and base metal coins of Argentina, please look at our original Chard Coins website.